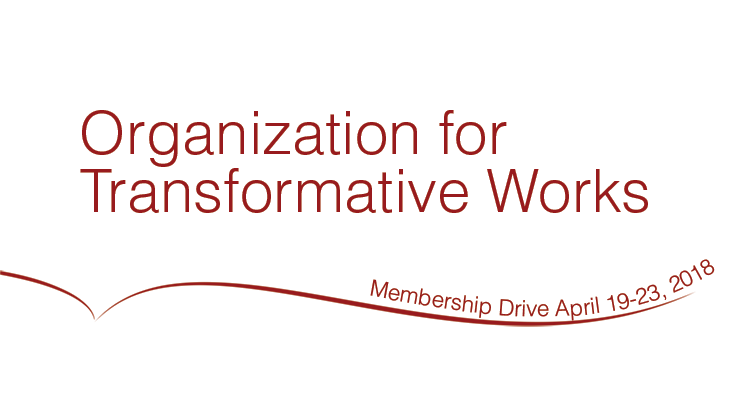 The Legal committee of the Organization for Transformative Works (OTW, the AO3’s parent organization) worked with the Archive of Our Own team to update AO3’s Terms of Service (ToS). This update is focused on data privacy, and on explaining in more detail how we process the data you give us while you use AO3. Below, you can read a summary of the changes. There’s also a full version of the updated ToS available for your review (HTML, PDF, Word). Thank you for supporting the OTW! Our April 2017 drive has come to a close, and we have raised over US$145,000 from over 5,600 individual donations representing 72 countries. Over 3,040 of these donations came from first-time donors. This week, we updated you on exciting developments in several OTW projects. We also told you about additional ways you can donate: corporate matching to amplify your impact, and recurring donations to get that amazing thank you gift you’ll love! We would like to recognize all the OTW volunteers working behind the scenes to make this drive, and everything we do, possible. This drive couldn’t have been successful without them, or without you. Once again, thank you for your generosity and support as we continue to grow as an organization.